Our business is the management of Property Development Delivery and Property Development Transactions for Developers, Land Owners, Industry, and Businesses from 'Mud-map to Money-in-the Bank'. Property Development success is initially enshrined in 'The Acquisition, The Market and The Deal', but management of the related Transactions and of the Delivery Process is crucial to meeting and exceeding the cost, revenue, and program goals first envisaged. Development Delivery Management succeeds on Property and Development knowledge, expertise, and experience. The disciplines of Project Management alone are insufficient. Commercial success for Industry and Businesses seeking new premises and facilities depends on being able to define real requirements, validate costs and cost savings, devise delivery and property strategies, and to forcefully manage delivery of all project objectives. With a history of Development Delivery success and profitability, and a background as; Queensland Development Manager at one of the countries largest and most respected Property Developers, Business Manager, Financial Analyst, Proprietor of a firm of Engineers Architects Project Managers Quantity Surveyors and Town Planners, Engineer and Project Manager with two of the countries largest Consulting Firms, Paul Evrat has the knowledge expertise and experience needed for Development Delivery success. We value relationships with Developers, Industry, and Business, and respond with confidentiality, integrity, energy and persistence. 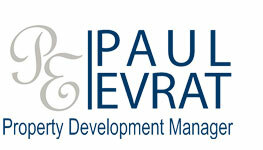 Your contact with Paul Evrat directly on 0404 845159, 07 38684646, or paul@paulevrat.com will be welcomed.